This is a “mini” review because I will only be talking about two different irons and a couple of accessories. There are quite obviously dozens of ski tuning irons on the market, from a variety of manufacturers, but the two reviewed here are two of the most popular in the Swix lineup. And if you are wondering, yes, I will also be talking about off-the-shelf clothes irons. This is a great no-nonsense waxing iron. It is inexpensive, easy to use, and the only moving part is an adjustable temperature dial. I tested this iron out and was pleased with the results. It was wide enough to accommodate my mid-fat skis (100mm underfoot). Like every iron I have ever used, the cord is too short. This is not a complaint specific to this iron, but ski irons in general. The cord is maybe ~2 feet longer than my skis (183cm) so an extension cord is almost always needed. This is my personal favorite iron. I have been using this model for more than five years, and love everything about it. 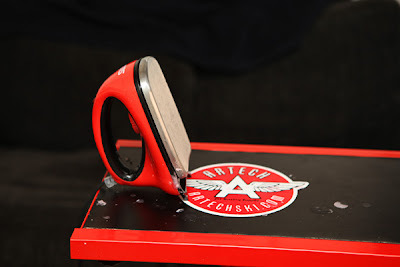 It is sturdy and has a good weight to it, which makes the waxing process smoother than when using lighter irons. The clip in front is used to hold a strip of fiberlene paper. Fiberlene is used between the base of the iron, and on top of the wax layer on the ski. It is used to prevent burning the base of the ski at higher iron temperatures, such as when using cold temperature wax, like Swix CH4 or CH6. 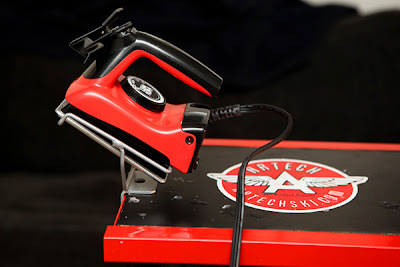 It also helps soak up excess wax, preventing it from dripping off the ski into the bindings, or onto the floor. Alternatively, fiberlene allows you to use less wax without risking a burned base. This is useful if you are using expensive race wax, and do not want to waste it. I also like the temperature dial on this iron. The dials reads in Celsius, but it also has markers for Swix’s most popular waxes. 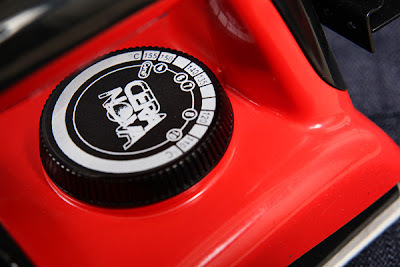 So if you have a stick of CH8 wax, you just turn the dial to CH8 and the iron will produce the ideal temperature for melting that particular wax. 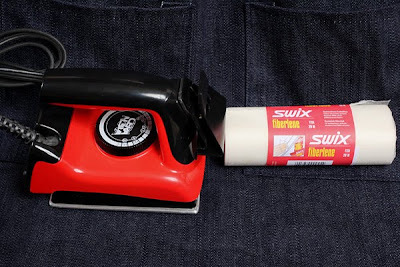 Another useful item is the Swix Wax Metal Iron Holder, which sells for $25. I was skeptical of this item at first; it looked gimmicky, and seemed expensive for a piece of bent steel wire. That said, now that I have used it, I couldn’t imagine working without one again. It is a simple tool, but it prevents me from knocking the iron off my tuning table, or from just tipping the iron onto its hot surface. 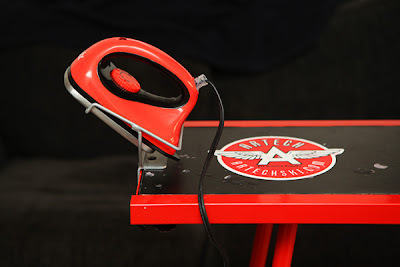 It is also useful for letting the iron cool down after waxing, without having to worry about it starting a fire. Maybe I am just paranoid, or clumsy, but this simple product is now on my must-have list. 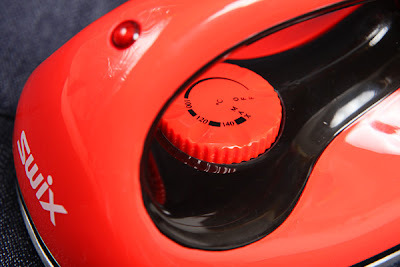 It’s been awhile since I’ve used a clothes iron as a waxing iron, and now that I have seen the light of real waxing irons, I definitely would not advocate using a regular clothes iron. 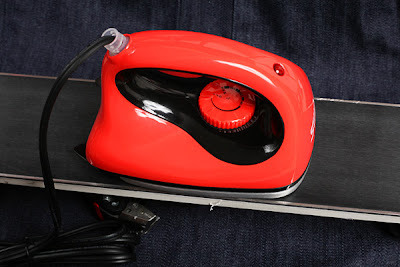 That said, I know that a lot of you are not going to spend the money on a legitimate waxing iron, so in the spirit of this blog and in the spirit of saving money, I will give some advice regarding clothes irons as ski waxing irons. 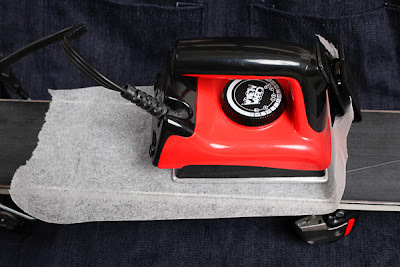 When you get down to it, clothes irons and waxing irons are just heated metal plates. Wax melts at a certain temperature. Apply wax to heated surface; melt into ski base, and voila! 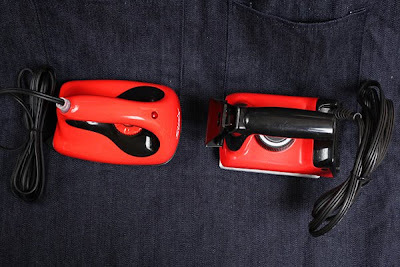 The problems arise when you look at what clothes irons were designed to do. They were designed to de-wrinkle clothing, and the best way to do that is with heat and steam. 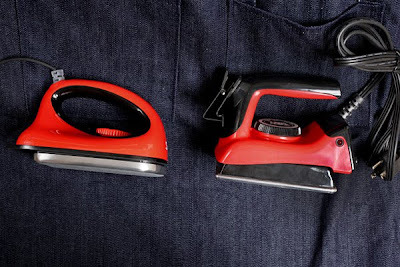 To accommodate steam, clothes irons have holes punched in the metal base. This is bad news for waxing, because the wax will clog those holes, causing the wax to burn, and doing unknown damage to the iron. Burned wax is not good for skis. 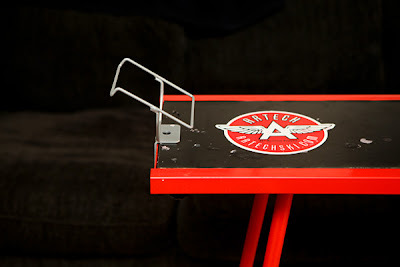 The holes also have the potential to collect dirt, which could easily be melted into the ski, or even scratch the base of the ski. Secondly, clothes irons are flat all around, whereas waxing irons are curved up on tip and tail, as well as on the sides. Thus, the clothes iron will plow the wax out of the way rather than allowing it to move under the metal plate and melt into the ski base. You also run the risk of scratching the base of the ski, which I have done in the past. 5. Never use the iron for clothes again! I use Swix wax, but have nothing against any of the other brands. I am just used to their temperature coding method, so it keeps things simple. ARTECH has a huge selection of Swix wax. For a basic waxing kit, I would recommend a bar of CH7 or CH8 for your everyday wax. For spring, go with the CH10. CH10 is also a good cleaning and storage wax. If you ski on particularly hard or icy snow, the CH6 or CH4 are good to have, but they can be a struggle to melt and scrape. The 60g Swix packs should last you 3 rounds of waxing, so I always buy the 180g bulk packs of wax. For only a few dollars more, you will get a seasons worth of wax: CH7 - 180g, CH8 - 180g, CH10 - 180g. Chapter 1: What's it going to cost me?